(click here for more on the RC350). The RC350 would be mechanically similar to the IS350 sedan with enough styling cues to obviously connect the two luxury models but rather than offer another generation of a coupe that shares a name with a sedan – the IS-based 2-door could finally get a name of its own. 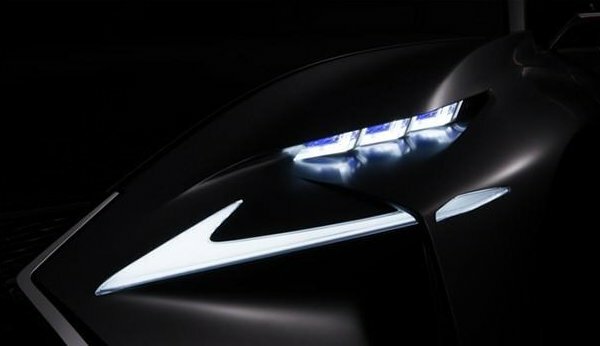 Today’s fresh teaser of the Frankfurt bound Lexus concept offers a shadowy look at the headlight design and just a touch of the grille. While the actual lighting element of the headlight differs from the IS sedan with some high tech LED fixtures, the way that the headlight is split into two distinct portions is an identical design to the new IS. That would lead us to believe that the Frankfurt concept is some new variation of the IS sedan – be it a coupe or perhaps the first look at the next generation IS-F – if not for the RC350 rumors. There is also the slim possibility that this teaser shows the high performance version of the RC which would likely be called the Lexus RC-F. While the lower portion of the lighting assembly looks a great deal like the design of the new Lexus IS sedan, I can’t help but notice how the internal portion of the headlight looks a little familiar. If you think about it, this headlight layout almost looks like the one featured in the BMW i8. Toyota has been working on a joint project with BMW that is expected to yield a midsized sports car with hybrid power so the most outlandish possibility is that this headlight belongs to the first phase in the partnership between Toyota and BMW. Again, that is probably the least likely option but it seemed like one worth mentioning. In any case, we know that Lexus will unveil a new concept that shares a very similar headlight and grille design with the new Lexus IS but whether it is the IS350 Coupe, the RC350 Coupe, the new IS-F, the RC-F or perhaps some uniquely named concept (like the LF-CC) will remain a question until the big announcement is made in Germany on September 10th. Joining the mystery concept teased above, the Frankfurt Motor Show will also bring about the European introduction of the Lexus GS300h. This new hybrid offering will feature the company’s 2.5L hybrid drivetrain so it should be more efficient and less polluting than the higher performance GS450h hybrid sold here in the US. American Lexus lovers who would like a piece of the GS300h shouldn’t get their hopes up as the Japanese automaker is happy with their current GS lineup hybrid offering and while the smaller engine could make the GS300h more efficient than the GS450h – it will also be much less powerful. In the American luxury segment, having plenty of power makes a big difference so even with their hybrid offerings – luxury brands like Lexus need to satisfy the American love of horsepower.